The original Tech 21 Fly Rig, introduced in 2014, was a true game-changer for players in all categories, from touring pros to bedroom hobbyists. At a time when pedalboards were expanding and backs were breaking, the innovative Fly Rig enabled players to slim down without sacrificing great tone, and travel without fear of baggage surcharges and dreaded mystery backlines. The Tech 21 Fly Rig 5 v2 retains the same SansAmp heart, Plexi/Cali distortion and Delay, but adds a few twists and turns within these sections. New features include an independent reverb with choice of eadphone capability and an XLR Output. It has the tonality of the Blonde Character Series pedal. It includes 3-band active EQ, Level and Drive controls. To dirty things up, you have the flexibility of using the Drive control, the Boost function, or you can add grit from the Plexi/Cali section — or all three. Each method achieves different tones. 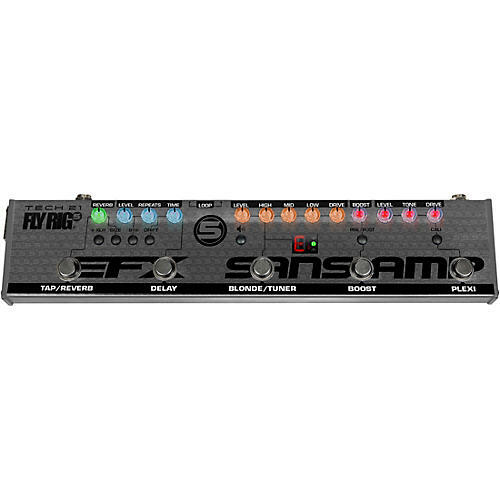 The all-analog SansAmp technology enables the Fly Rig 5 to run directly into mixers of recording desks and PA systems, as well as augment your existing amplifier set-up. It provides the dirtier side of the Fly Rig 5. You have a choice of a roaring Plexi tone with its muscular crunch, detailed mids and mule-kick low end or the chunk of a '70s high gain amp tone inspired by the then-boutique shop over on the West Coast. Switchable Pre/Post Boost up to approx 12dB to beef up drive and distortion or increase the overall volume to punch up fills and solos. Voiced for the sounds of a vintage tape echo, with Time and Repeats controls. The Delay includes a switch to change from 1/4-notes to dotted 8ths. A Drift button adds a random, unpredictable element to the modulation in keeping with its vintage roots. Post-SansAmp, pre-effects to patch in external effect pedals. Chromatic Tuner, operable via the BLONDE/TUNER footswitch. You simply hold the footswitch down to engage, which simultaneously mutes the signal path. Zealand for use anywhere in the world.